In these new times of thinking “green” the average consumer, wanting to do the right thing, is faced by assaults from all fronts. Is it good for the environment? Does it pollute? Is it renewable? Is it healthy? Choices, decisions, factors of all types affect how we should behave. There are two types of energy: renewable and non-renewable. Renewable energy = sun, wind, water, firewood, etc. Non-renewable energy = coal, crude oil and natural gas, etc. The energy generated from the sun is known as solar energy. That from water is hydroelectric. From firewood, animal dung, city biodegradable waste and agro-residue known as biomass. Geothermal energy from hot dry rocks, magma, hot water springs, natural geysers, is called biogas, etc. All the renewable sources of energy are fairly non-polluting and considered clean forms of energy. Burning wood rather than gas or oil is good because the resource is renewable. It is essentially solar energy — sunshine trapped by photosynthesis into the tree’s tissue is released as heat in your home, so there’s no net increase in heat at the earth’s surface (discounting the time the energy is stored in the tree). An efficient fireplace releases mostly water vapor and carbon dioxide. The latter is a factor in global warming, but in the case of burning wood, no more so than if the tree had died in the forest and decomposed there. By contrast, burning coal, gas or oil releases CO2 that would otherwise have remained trapped underground. While it is true that burning firewood can release particulates into our atmosphere, these particulates are for the most part organic, these in turn will bind with the “polluting” inorganic particulates already present in the atmosphere, making them heavy and making them fall to the earth faster, thus in effect, cleaning our air. Renewable energy is derived from sources that never run out. 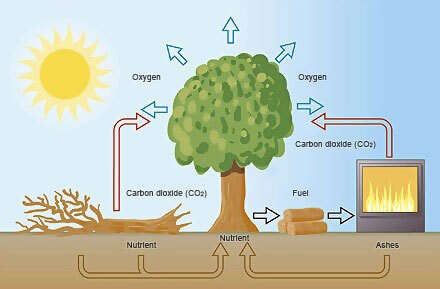 The organic matter consumed is replaced as trees and other plants grow, without disruption to the natural carbon cycle. Fossil fuels, such as oil, coal and natural gas, release into the atmosphere vast amounts of additional carbon that would otherwise be stored below the earth, contributing to rising global temperatures through the greenhouse effect. Thinking “GREEN” in today’s society: If you are burning wood you are conserving fossil fuels. The following discussion is somewhat rhetorical, but you may find it useful in discussions with others. As a tree grows, it absorbs sunlight (heat & energy), carbon dioxide and soil nutrients to create wood fibre, while producing oxygen (02) in the process. When a tree is burned it releases the stored energy in the form of heat, consumes oxygen, and releases its nutrients in the form of ash. It will make the identical amount of C02 during combustion as it absorbed during growth. If that same tree is dumped in a land fill or decays on the forest floor, it will decompose into identical chemicals and produce the same volume of heat, although slower. Have you ever felt a compost pile heat up? If you do not burn wood to obtain the heat that the fibre contains, the wood will decompose (oxidize) into C02, heat, and ash anyway. If you burn oil, gas or coal (electricity) to make the heat you need, you give our planet a double dose of C02 … once from the wood waste composting and a second dose from the combustion of fossil fuels.